This would have gone into the Rant and Rave column except I don’t have anything else that qualifies today. I think this cat belongs to our new neighbors. It has discovered our chickens. My girls are not the smartest. In fact, they fly into a tizzy at the mere sight of a predator. They lose feathers, they bang up against the walls, and most importantly, THEY STOP LAYING EGGS. And now this little feline has started using my vegetable garden as a litter box. That’s not very neighborly now, is it?! I don’t allow my dog to wander into other people’s yards, pooping in their gardens, and terrorizing their pets. How is it ok for other’s to do the same in my yard? This is the second cat that has discovered both my garden and the chickens. 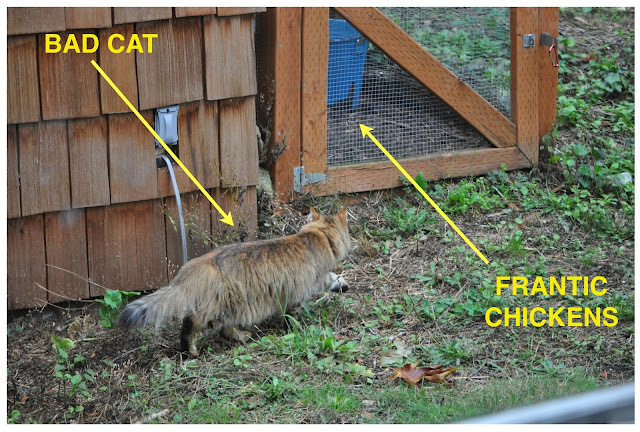 I used cayenne pepper to stop the cat for doing its foul deeds in the garden…and that worked for a while. But frankly, I don’t think the onus should be on me to prevent this pet from desecrating the lettuce. Ask the neighbors to keep their cat out of my yard? Buy a bb gun? Hope that it gets killed by a car? Or eaten by a coyote? This is why our cats are all indoors. I tend to hate most outdoor cats. You could get one of those scarecrow things and aim it at where the cat comes in. It's cat-size critter activated, so if the cat comes, it will spray water at the cat. Though, cats don't usually take the same path all the time out of the yard, so that might be futile. This sounds rather evil, but you could grab the cat and take it to the shelter, anonymously. If that happens many times, the owners might make their cat an indoor cat. Finally, you could see what the rules are about critters threatening poultry/livestock (and if your chickens qualify as "livestock." There may be rules that help you out. Or, you could just gather up cat poo and put it on the neighbor's front mat. THat could encourage the cat to quickly become indoors too! Well, as a cat owner (semi-outdoor) I have to tell you that one can't really control a cat. So if you choose to let your cat roam, you have to know that it might get eaten or run over or sprayed with a hose. Cats hate water and I think spraying the cat when you see it would be a totally humane way to keep it the hell away. Cats learn fast. The funny thing is that we did have a neighbor that got so fed up with another neighbor not picking up his dog’s deposits that were left in front of all our houses that she did start bagging it up and throwing it in his driveway. I can’t really say if it worked or not because the guy died a few months ago. Needless to say, it solved the problem. Unfortunately, one of the problems I have is that I can’t see our vegetable garden from the house. The shed is in the way. So I can’t be vigilant with my hose. Same goes for the back of the chicken’s run. So I’m pondering my options. I sent Bailey out to put the fear of god in him/her so I’m hoping that perhaps that tactic did the trick. If the problem persists then perhaps a polite comment to the neighbors might be in order. The scarecrow is motion-activated, so no need to see the culprit! Also, my neighbor had success in keeping cats out of his garden by putting up a wire fence that was 4' high. Held in with stakes every 15' or so, the fence was solid enough to not fall down, but wobbly enough to keep cats from climbing over it. A little expensive, but just a thought. So I guess the heart of my problem is that I don't feel like I should spend time, energy, or money to keep somebody's cat off my property. I feel like that's the owner's responsibility. I dunno. There dont seem to be many happy solutions here.